George Randolph Scott (January 23, 1898 – March 2, 1987) was an American film actor whose career spanned the years from 1928 to 1962. As a leading man for all but the first three years of his cinematic career, Scott appeared in a variety of genres, including social dramas, crime dramas, comedies, musicals (albeit in non-singing and non-dancing roles), adventure tales, war films, and a few horror and fantasy films. However, his most enduring image is that of the tall-in-the-saddle Western hero. Out of his more than 100 film appearances over 60 were in Westerns; thus, "of all the major stars whose name was associated with the Western, Scott most closely identified with it." Scott's more than 30 years as a motion picture actor resulted in his working with many acclaimed screen directors, including Henry King, Rouben Mamoulian, Michael Curtiz, John Cromwell, King Vidor, Allan Dwan, Fritz Lang, Sam Peckinpah, Henry Hathaway (eight times), Ray Enright (seven), Edwin L. Marin (seven), Andre DeToth (six), and most notably, his seven film collaborations with Budd Boetticher. Scott also worked with a diverse array of cinematic leading ladies, from Shirley Temple and Irene Dunne to Mae West and Marlene Dietrich. In his earlier Westerns ... the Scott persona is debonair, easy-going, graceful, though with the necessary hint of steel. As he matures into his fifties his roles change. Increasingly Scott becomes the man who has seen it all, who has suffered pain, loss, and hardship, and who has now achieved (but at what cost?) a stoic calm proof against vicissitude. During the early 1950s, Scott was a consistent box-office draw. In the annual Motion Picture Herald Top Ten Polls, he ranked 10th in 1950, seventh in 1951, and 10th in both 1952 and 1953. Scott also appeared in the Quigley's Top Ten Money Makers Poll from 1950 to 1953. Scott was born in Orange County, Virginia, but reared in Charlotte, North Carolina, the second of six children born to parents of Scottish descent. His father was George Grant Scott, born in Franklin, Virginia, an administrative engineer in a textile firm. His mother was Lucille Crane Scott, born in Luray, Virginia, a member of a wealthy North Carolina family. The Scott children in order of birth were: Margaret, Randolph, Katherine, Virginia, Joseph and Barbara, most born in North Carolina. Because of his family's financial status, young Randolph was able to attend private schools such as Woodberry Forest School. From an early age, Scott developed and displayed his athleticism, excelling in football, baseball, horse racing, and swimming. In April 1917, the United States entered World War I and shortly afterwards, Scott, then 19 years old, joined the United States Army. He served in France as an artillery observer with the 2nd Trench Mortar Battalion, 19th Field Artillery Regiment. His wartime experience gave him training that was put to use in his later film career, including horsemanship and the use of firearms. After the Armistice brought World War I to an end, Scott stayed in France and enrolled in an artillery officers' school. Although he eventually received a commission, Scott decided to return to America and thus journeyed home around 1919. With his military career over, Scott continued his education at Georgia Tech where he was a member of the Kappa Alpha Order and set his sights on becoming an all-American football player. However a back injury prevented him from achieving this goal. Scott then transferred to the University of North Carolina, where he majored in textile engineering and manufacturing. As with his military career, however, he eventually dropped out of college and went to work as an accountant in the textile firm where his father was employed. Around 1927, Scott developed an interest in acting and decided to make his way to Los Angeles and seek a career in the motion picture industry. Fortunately, Scott's father had become acquainted with Howard Hughes and provided a letter of introduction for his son to present to the eccentric millionaire filmmaker. Hughes responded by getting Scott a small part in a George O'Brien film called Sharp Shooters (1928). Despite its title and the presence of O'Brien, Sharp Shooters is not a western, as some film historians claimed. Rather, it's a romantic comedy. A print of the film survives in the UCLA Film and Television Archive. In the next few years, Scott continued working as an extra and bit player in several films, including Weary River (1929) with Richard Barthelmess, The Far Call (1929), The Black Watch (1929) (directed by John Ford with John Wayne also uncredited) and The Virginian (1929) with Gary Cooper. Reputedly, Scott also served as Cooper's dialect coach in this latter film. Scott was also uncredited on Dynamite (1929) directed by Cecil B. De Mille, and Born Reckless (1930). In 1931 Scott played his first leading role (with Sally Blane) in Women Men Marry (1931), a film, now apparently lost, that was made by a Poverty Row studio called Headline Pictures. A silent film by the same name from 1922, directed by Edward Dillon, has apparently been preserved, however, at Filmmuseum Amsterdam. The Library of Congress American Silent Feature Film Survival Catalog:..Women Men Marry. He followed that movie with a supporting part in a Warner Bros. production starring George Arliss, A Successful Calamity (1932). In 1932 Scott appeared in a play at the Vine Street Theatre in Hollywood entitled Under a Virginia Moon. His performance in this play resulted in several offers for screen tests by the major movie studios. Scott eventually signed a seven-year contract with Paramount Pictures at a salary of USD $400 per week (Expression error: Unrecognized punctuation character "[". per week in 2018). Scott's first role under his new Paramount contract was a small supporting part in a comedy called Sky Bride (1932) starring Richard Arlen and Jack Oakie. Following that, however, Paramount cast him as the lead in Heritage of the Desert (1932), his first significant starring role and also the one that established him as a Western hero. As with Women Men Marry, Sally Blane was his leading lady. Henry Hathaway made his directorial debut with Heritage of the Desert. The film was popular and Scott would go on to make ten "B" Western films loosely based on the novels of Zane Grey. Many of these Grey adaptations were remakes of earlier silent films. In an effort to save on production costs, Paramount utilized stock footage from the silent version and even hired some of the same actors, such as Raymond Hatton and Noah Beery, to repeat their roles. For the 1933 films The Thundering Herd and Man of the Forest, Scott's hair was darkened and he sported a trim moustache so that he could easily be matched to footage of Jack Holt, the star of the silent versions. 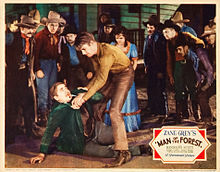 To the Last Man was almost a model of its kind, an exceptionally strong story of feuding families in the post-Civil War era, with a cast worthy of an "A" feature, excellent direction by Henry Hathaway, and an unusual climactic fight between the villain (Jack LaRue) and the heroine (Esther Ralston, in an exceptionally appealing performance). Sunset Pass... was not only one of the best but also one of the most surprising in presenting Randolph Scott and Harry Carey as heavies. The Zane Grey series were a boon for Scott, as they provided him with "an excellent training ground for both action and acting". In between his work in the Zane Grey Western series, Paramount cast Scott in several non-Western roles, such as "the other man" in Hot Saturday (1932), with Nancy Carroll and Cary Grant. Scott returned to Zane Grey Westerns with Wild Horse Mesa (1932), then was the romantic male lead in Hello, Everybody! (1933), an odd one-shot attempt to make a film star out of the popular but heavy-set radio singer Kate Smith. The Thundering Herd (1933) was another Zane Grey Western with Hathaway, then he was in two horror movies, Murders in the Zoo (1933) with Lionel Atwill and Supernatural (1933) with Carole Lombard. After the Western Sunset Pass (1933), Paramount loaned Scott to Columbia, to play Bebe Daniels's love interest in a minor romantic comedy called Cocktail Hour (1933). 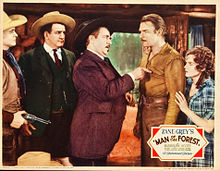 Back at Paramount Scott did the Westerns Man of the Forest (1933) and To the Last Man (1933), both with Hathaway from Grey novels. He was loaned to Monogram Pictures for Broken Dreams (1933) then was back with Hathaway for The Last Round-Up (1934). Scott did three more Zane Grey Westerns without Hathaway: Wagon Wheels (1934) directed by Charles Barton, Home on the Range (1935) from Arthur Jacobson, and Rocky Mountain Mystery (1935) with Barton. Paramount loaned Scott to RKO Radio Pictures to support Fred Astaire, Ginger Rogers and Irene Dunne in Roberta (1935), a hugely popular adaptation of the Broadway musical. RKO liked Scott and kept him on for Village Tale (1935), directed by John Cromwell, and She (1935), an adaptation of the classic novel by H. Rider Haggard from the makers of King Kong. Scott went back to Paramount for So Red the Rose (1935) with Margaret Sullavan, then was reunited with Astaire and Rogers at RKO in Follow the Fleet (1936). It was another big hit. Scott was in a car drama at Paramount, And Sudden Death (1936), directed by Barton, then was loaned to independent producer Edward Small, to play Hawkeye in another adventure classic, The Last of the Mohicans, adapted from the 1826 novel by James Fenimore Cooper. A big hit in its day, the film "gave Scott his first unqualified 'A' picture success as a lead." ... set in 1859 in Pennsylvania, and follows the exploits of oil prospector Scott as he struggles against various varmints and vested interests out to wreck his business, and tries to keep his marriage to Irene Dunne intact, despite the tempting presence of saloon singer Dorothy Lamour. Scott went to 20th Century Fox to play the romantic male lead in a Shirley Temple film, Rebecca of Sunnybrook Farm (1938). At Paramount he made a well budgeted Western The Texans (1938) with Joan Bennett then he starred in The Road to Reno (1938) at Universal. One missed opportunity came about around this time. Due to his Southern background, Scott was considered for the role of Ashley Wilkes in Gone with the Wind, but it was Leslie Howard who eventually got the part. Scott's contract with Paramount ended and he signed a deal with Fox. They put him in Jesse James (1939), a lavish highly romanticized account of the famous outlaw (Tyrone Power) and his brother Frank (Henry Fonda). Scott was billed fourth as a sympathetic marshal after the James brothers; it was his first film in color. Scott was reunited with Temple in Susannah of the Mounties (1939), Temple's last profitable film for Fox. The studio gave him the lead in Frontier Marshal (1939), playing Wyatt Earp. Scott went to Columbia to star in a medium budget action film, Coast Guard (1939). Back at Fox he was in a war movie, 20,000 Men a Year (1939). Scott went over to Warner Bros to make Virginia City (1940), billed third after Errol Flynn and Miriam Hopkins, playing Flynn's antagonist, a Confederate officer - but a sympathetic one, and not the actual villain (he was played by Humphrey Bogart). There were frequent disputes between director Michael Curtiz, actors and producer Hal Wallis about script changes. But Curtiz recalled that Scott tried to stay out of those arguments: "Randy Scott is a complete anachronism," said Curtiz. "He's a gentleman. And so far he's the only one I've met in this business..." According to Nott, Curtiz and Scott got along well both personally and creatively, with Scott giving one of the top performances in his career. Scott went back to RKO to play the "other man" role in the Irene Dunne–Cary Grant romantic comedy My Favorite Wife (1940), a huge hit for RKO. For Universal, he starred with Kay Francis in When the Daltons Rode (1940). Randolph Scott, who is getting to look and act more and more like William S. Hart, herein shapes one of the truest and most appreciable characters of his career as the party's scout. In 1941, Scott also co-starred with a young Gene Tierney in another western, Belle Starr. After a spy film with Elisabeth Bergner, Paris Calling (1941), he was in a hugely popular war film at Fox with John Payne and Maureen O'Hara, To the Shores of Tripoli (1942). Scott's only role as a truly evil villain was in Universal's The Spoilers (1942), a rip-roaring adaptation of Rex Beach's 1905 tale of the Alaskan gold rush also starring Marlene Dietrich and John Wayne. The movie's climax featured Scott and Wayne (and their stunt doubles) in one of the most spectacular fistfights ever filmed. The Dietrich-Scott-Wayne combination worked so well that Universal recast the trio that same year in Pittsburgh, a war-time action-melodrama which had Wayne and Scott slugging it out once more. Scott was billed above Wayne in both films but Wayne actually played the heroic leading man roles and enjoyed more screen time in each movie. Shortly after the United States entered World War II, Scott attempted to obtain an officer's commission in the Marines, but because of a back injury years earlier, he was rejected. However, he did his part for the war effort by touring in a comedy act with Joe DeRita (who later became a member of the Three Stooges) for the Victory Committee showcases, and he also raised food for the government on a ranch that he owned. In 1942 and 1943, Scott appeared in several war films, notably To the Shores of Tripoli (1942) at Fox, Bombardier (1943) at RKO, the Canadian warship drama Corvette K-225 (1943) (produced by Howard Hawks), Gung Ho! at Universal and China Sky (1945) at RKO. He also made The Desperadoes (1943), Columbia Pictures' first feature in Technicolor. The film was produced by Harry Joe Brown, with whom Scott would form a business partnership several years later. Scott was one of many Universal stars who made a cameo in Follow the Boys (1944). He was in a "northern" with Gypsy Rose Lee, Belle of the Yukon (1944), and made a swashbuckler film for producer Benedict Bogeaus alongside Charles Laughton: the cheaply made production Captain Kidd (1945). In 1946, after playing roles that had him wandering in and out of the saddle for many years, Scott appeared in Abilene Town, a UA release which cast him in what would become one of his classic images, the fearless lawman cleaning up a lawless town. The film "cemented Scott's position as a cowboy hero" and from this point on all but two of his starring films would be Westerns. The Scott Westerns of the late 1940s would each be budgeted around US$1,000,000, equal to $12,800,000 today. Scott mostly made Westerns for producers Nat Holt or Harry Joe Brown or at Warner Bros, although he did make Albuquerque (1948) at Paramount. Scott's last non-Westerns were a mystery with Peggy Ann Garner at Fox, Home Sweet Homicide (1947), and a family drama for Bogeaus, Christmas Eve (1947). He also had a cameo in Warners' Starlift (1951). Scott did two Westerns for Nat Holt at RKO, Badman's Territory (1946) and Trail Street (1947). He followed it with another pair for Holt at that studio, Return of the Bad Men (1948) at RKO and Canadian Pacific (1949), then they did Fighting Man of the Plains (1950) and The Cariboo Trail (1950) at Fox. Scott also made Rage at Dawn in 1955 for Nat Holt, which was released by RKO starring Scott and Forrest Tucker, and featuring Denver Pyle, Edgar Buchanan, and J. Carrol Naish. It purports to tell the true story of the Reno Brothers, an outlaw gang which terrorized the American Midwest, particularly Southern Indiana, soon after the American Civil War. 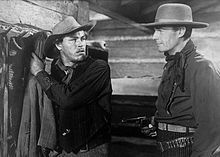 Scott renewed his acquaintance with producer Harry Joe Brown at Columbia with Gunfighters (1947). They began producing many of Scott's Westerns, including several that were shot in the two-color Cinecolor process. Their collaboration resulted in the film Coroner Creek (1948) with Scott as a vengeance-driven cowpoke who "predates the Budd Boetticher/Burt Kennedy heroes by nearly a decade," and The Walking Hills (1949), a modern-day tale of gold hunters directed by John Sturges. Scott did Colt .45 (1950) at Warner Bros. where his salary was US$100,000 per picture (equal to $1,100,000 today). He stayed at the studio to do Sugarfoot (1951), Fort Worth (1951), Carson City (1952), The Man Behind the Gun (1953), Thunder Over the Plains (1953), Riding Shotgun (1954), Tall Man Riding (1955) Most of these were directed by André de Toth. Also of interest is Shootout at Medicine Bend shot in 1955, but released in 1957, which was Scott's last movie in black and white. The movie co-stars James Garner and Angie Dickinson. By 1956, Scott turned 58, an age where the careers of most leading men would be winding down. Scott, however, was about to enter his finest and most acclaimed period. In 1955, screenwriter Burt Kennedy wrote a script entitled Seven Men from Now which was scheduled to be filmed by John Wayne's Batjac Productions with Wayne as the film's star and Budd Boetticher as its director. However, Wayne was already committed to John Ford's The Searchers. Wayne therefore suggested Scott as his replacement. The resulting film, released in 1956, did not make a great impact at the time but is now regarded by many as one of Scott's best, as well as the one that launched Scott and Boetticher into a successful collaboration that totaled seven films. Boetticher achieved works of great beauty, formally precise in structure and visually elegant, notably for their use of the distinctive landscape of the California Sierras. As the hero of these "floating poker games" (as Andrew Sarris calls them), Scott tempers their innately pessimistic view with quiet, stoical humour, as he pits his wits against such charming villains as Richard Boone in The Tall T and Claude Akins in Comanche Station. After 7th Cavalry (1956), Boetticher, Kennedy and Scott were reunited for their second film, The Tall T (1957) which co-starred Richard Boone. The third in the series was Decision at Sundown (1957), although that script was not written by Kennedy. The unofficial series continued with Buchanan Rides Alone (1958). In 1962 Scott made his final film appearance in Ride the High Country, a film now regarded as a classic. It was directed by Sam Peckinpah and co-starred Joel McCrea, an actor who had a screen image similar to Scott's and who also from the mid-1940s on devoted his career almost exclusively to Westerns. Scott and McCrea's farewell Western is characterized by a nostalgic sense of the passing of the Old West; a preoccupation with the emotionality of male bonding and of the experiential 'gap' between the young and the old; and the fearful evocation, in the form of the Hammonds (the villains in the film), of these preoccupations transmuted into brutal and perverse forms. McCrea, like Scott, retired from filmmaking after this picture, although he returned to the screen twice in later years. Scott married twice. In 1936, he became the second husband of heiress Marion duPont, daughter of William Du Pont Sr., and great-granddaughter of Éleuthère Irénée Du Pont de Nemours, the founder of the E.I. du Pont de Nemours and Company. Marion had previously married George Somerville, with Scott serving as best man at the wedding. The Scotts' marriage ended in divorce three years later, in 1939. The union produced no children. Though divorced, she kept his last name nearly five decades, until her death in 1983. In 1944, Scott married the actress Patricia Stillman, who was 21 years his junior. In 1950, they adopted two children, Sandra and Christopher. Although Scott achieved fame as a motion picture actor, he managed to keep a fairly low profile with his private life. Offscreen he was good friends with Fred Astaire and Cary Grant. He met Grant on the set of Hot Saturday (1932), and shortly afterwards, to save on living expenses, they shared a beach house for 12 years in Malibu that became known as "Bachelor Hall". In 1944, Scott and Grant stopped living together but remained close friends throughout their lives. While there had been some rumors that they were a romantic couple, Scott's adopted son, Christopher, said the rumors were untrue. Some Hollywood stars of the era have speculated that Scott was in fact bisexual. Following Ride the High Country, Scott retired from film at the age of 64. A wealthy man, Scott had managed shrewd investments throughout his life, eventually accumulating a fortune worth a reputed $100 million, with holdings in real estate, gas, oil wells, and securities. He and his wife Patricia continued to live in his custom, mid-century modern, Burton A. Schutt-designed home at 156 Copley Place, Beverly Hills. During his retirement years he remained friends with Fred Astaire, with whom he attended Dodgers games. An avid golfer with a putting green in his yard, Scott was a member of the Bel Air Country Club, Los Angeles Country Club and Eldorado Country Clubs. Scott also became friends with the Reverend Billy Graham. Scott was described by his son Christopher as a deeply religious man. He was an Episcopalian and the Scott family were members of All Saints' Episcopal Church in Beverly Hills, and St. Peter's Episcopal Church in Charlotte, North Carolina. Scott died of heart and lung ailments in 1987 at the age of 89 in Beverly Hills, California. He was interred at Elmwood Cemetery in Charlotte, North Carolina. He and his wife Patricia had been married for 43 years. Patricia Stillman Scott died in 2004. The Scotts are buried together in the Elmwood Cemetery in Charlotte NC. Their mid-century modern home was torn down in 2008. Scott's face reportedly was used as the model for the Oakland Raiders logo in 1960; the logo was redesigned in 1963. For over 50 years, the iconic Raiders head would experience minor modifications and remain consistent with the original design. In Thomas Pynchon's 1963 book V., the character Profane watches an unspecified Randolph Scott film and compares himself unfavorably with his hero, whom he describes as "cool, imperturbable, keeping his trap shut and only talking when he had to – and then saying the right things and not running off haphazard and inefficient at the mouth". He is caricatured in the Lucky Luke comic book album Le Vingtième de cavalerie (1965) as Colonel McStraggle. The 1974 comedy film Blazing Saddles paid homage to Scott. When faced by a crowd refusing to cooperate, Sheriff Bart (Cleavon Little) exclaims "You'd do it for Randolph Scott!" whereupon the crowd in unison hymns "Randolph Scott!" and sets about working. Scott is the putative subject of the 1974 Statler Brothers song "Whatever Happened to Randolph Scott? ", lamenting the passing of Western films. Scott is the subject of guitarist Leo Kottke's song "Turning into Randolph Scott (Humid Child)" on his 1994 album Peculiaroso. In 1975, Scott was inducted into the Western Performers Hall of Fame at the National Cowboy & Western Heritage Museum in Oklahoma City, Oklahoma, United States. He also received an In Memoriam Golden Boot Award for his work in Westerns. For his contribution to the motion picture industry, Scott has a star on the Hollywood Walk of Fame at 6243 Hollywood Blvd. In 1999, a Golden Palm Star on the Palm Springs, California, Walk of Stars was dedicated to him. Despite his southern background at a time when the region was solidly Democratic in political affiliation, Randolph Scott was an active Republican. In 1944, he attended the massive rally organized by David O. Selznick in the Los Angeles Coliseum in support of the Dewey-Bricker ticket as well as Governor Earl Warren of California, who would become Dewey's running mate in 1948. The gathering drew 93,000, with Cecil B. DeMille as the master of ceremonies and short speeches by Hedda Hopper and Walt Disney. Among those in attendance were Ann Sothern, Ginger Rogers, Adolphe Menjou, and Gary Cooper. Despite the good turnout at the rally, most Hollywood celebrities who took a public position sided with the Roosevelt-Truman ticket. ^ Mueller 1985, p. 65. ^ Nott 2004, p. 4. ^ "Top Ten Money Making Stars of the past 79 years." Archived 2014-12-21 at the Wayback Machine quigleypublishing.com. Retrieved: June 9, 2012. ^ a b Nott 2004, p. 7. ^ Nott 2004, p. 1. ^ a b Nott 2004, p. 8. ^ Ringgold, Gene. "Randolph Scott: Everyone's Idea of a Southern Gentleman." Films in Review. 1972. ^ Nott 2004, p. 136. ^ Nott 2004, p. 10. ^ Everson, William K. The Hollywood Western: Ninety Years of Cowboys and Indians, Train Robbers, Sheriffs and Gunslingers. New York. Citadel Press, 1992, First edition 1969. ^ Nott 2005, p. 9. ^ Nott 2004, p. 43. ^ Nott 2004, p. 58. ^ Nott 2004, p. 59. ^ The New York Times, February 7, 1941. ^ Nott 2004, p. 67. ^ Gritten 2008, p. 8. ^ Nott 2005, p. 15. ^ Nott 2005, p. 29. ^ Gritten 2008, p. 1071. ^ Nott 2005, p. 131. ^ Wilmington, Michael. "Tall in the director's chair Budd Boetticher made some of the best-remembered westerns of '50s and '60s; they don't make 'em like that (or him) anymore." Los Angeles Times, November 29, 1992, p. 4. ^ Sargent, Sarah. "A tomboy's legacy." Living Virginia. Retrieved: July 1, 2016. ^ a b c "Randolph Scott is dead at 89". The New York Times. March 3, 1987. Retrieved July 22, 2018. ^ Nott 2005, p. 11. ^ a b "Durable, wealthy Randolph Scott manages fortune". Sarasota Herald Tribune. July 31, 1978. ^ Nott 2004, p. 191. ^ "Randolph Scott papers, ca. 1890s-1997". ^ Nott 2004, p. 225. ^ Powell. William S. "Scott, George Randolph." State Library of North Carolina, 1994. Retrieved: July 1, 2016. ^ Wilson, Scott. Resting Places: The Burial Sites of More Than 14,000 Famous Persons, 3d ed. : 2 (Kindle Location 42306). McFarland & Company, Inc., Publishers. Kindle Edition. ^ "The Evolution of the Oakland Raiders Logo". Fanatics. December 23, 2016. Retrieved April 13, 2018. ^ "Lucky Luke." stripsuithedenenverleden.nl. Retrieved: July 1, 2016. ^ "1999." Archived 2012-10-13 at the Wayback Machine Palm Springs Walk of Stars by date dedicated. Retrieved: August 5, 2012. ^ Jordan 2011, pp. 231–232. ^ "Those were the days." Nostalgia Digest, Volume 39, Issue 2, Spring 2013, pp. 32–39. ^ "Radio's golden age." Nostalgia Digest, Volume 38, Issue 3, Summer 2013, pp. 40–41. Bogdanovich, Peter. Who the Hell's in It: Conversations with Hollywood's Legendary Actors. New York: Random House, 2010. ISBN 978-0-3454-8002-6. Boscombe, Edward (ed). The BFI Companion to the Western. New York: DiCapo Press, 1988. ISBN 978-0-2339-8857-3. Crow, Jefferson Brim, III. Randolph Scott: The Gentleman From Virginia. Silverton, Idaho: Wind River Publishing, 1987. ISBN 0-940375-00-1. Everson, William K. The Hollywood Western: 90 Years of Cowboys and Indians, Train Robbers, Sheriffs and Gunslingers, and Assorted Heroes and Desperados. New York: Citadel Press, 1992, First edition 1969. ISBN 978-0-8065-1256-3. Gritten, David, ed. Halliwell's Film Guide 2008 (Halliwell's the Movies That Matter). New York: Harper Collins, 2008. ISBN 978-0-00-726080-5. Jordan, David M. FDR, Dewey, and the Election of 1944. Bloomington, Indiana: Indiana University Press, 2011. ISBN 978-0-253-35683-3. Mueller, John. Astaire Dancing: The Musical Films. New York: Alfred A. Knopf, 1985. ISBN 0-394-51654-0. Nott, Robert. The Films of Randolph Scott. Jefferson, North Carolina: McFarland & Company, 2004. ISBN 0-7864-1797-8. Nott, Robert. Last of the Cowboy Heroes: The Westerns of Randolph Scott, Joel McCrea, and Audie Murphy. Jefferson, North Carolina: McFarland, 2005, First edition 2000. ISBN 978-0-7864-2261-6. Scott, C.H. Whatever Happened to Randolph Scott? Madison, North Carolina: Empire Publishing, 1994. ISBN 0-944019-16-1. Thomas, Tony. Hollywood and the American Image. Westport, Connecticut: Arlington House, 1981. ISBN 978-0-87000-525-1. Wikimedia Commons has media related to Randolph Scott.